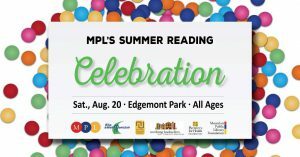 Montclair Public Library & Foundation’s Summer Reading Celebration will be at Edgemont Park on Saturday, August 20 from 9am to 5pm. Kids, teens, and adults are invited to this day of programs, activities and good old fashioned fun. The event will feature yoga, mini-Adult School of Montclair programs focused on health, fitness, and nutrition, as well as a story-book walk for the little ones. Health and fitness groups from town will also be there to help you keep moving to a happy healthy life! For event day details, click here.